A special thanks to Lampyridae who saved me the bother of finding the right thread. When you report off topic stuff (via report to mod) giving the place you suggest that we move things to? Really helps a lot and is really appreciated. If the primary purpose of the domes are access to natural sunlight/outside view without a spacesuit, with plants in it for primarily psychological/aesthetic benefits (even if they are also edible plants), then they probably don't have to be all that large. 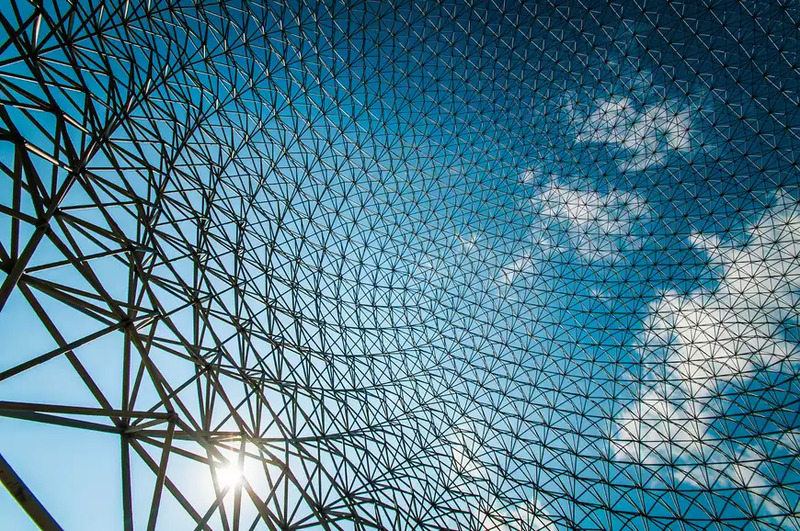 More, smaller domes might be better - less structurally demanding, and if the smaller domes have a higher glass-to-framework ratio, they might *feel* just as open if not more so. If the domes are a primary food production area, though, you'd probably want them larger. I renew my objection to any "window" exposed directly to a line of sight leading to the atmosphere on Mars. That atmosphere will hardly slow or filter or burn up incoming rocks or radiation of any kind, leaving a necessity for complex support and emergency repair systems as well as thicker and more complexly produced glass, itself. I think the Mars atmosphere would stop micrometeorites. Larger meteorites probably are not common enough to worry about; even if the rate is 1000x what it is on Earth, what percentage of buildings on Earth have ever been damaged by meteorites? 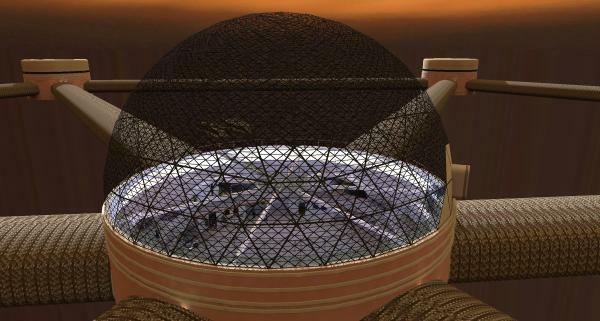 Especially since the concept here seems to be domes as a fairly small portion of a mostly subterranean Mars colony ... they will not be very large targets. Mirrors can be used to bring light and images (properly erected) to properly protected windows, but I have seen no evidence that lack of external lines of sight is the kind of psychological problem that has been evinced in theses parts. I don't think there would be any way to get that evidence... You really don't have situations on Earth where people have no access to natural light/outdoor views for longer than, say, a nuclear sub tour of duty - except maybe some prisons with poor conditions, and that's not even close to a representative psychological sample. Referring to the ISS or to the LEM isn't of much help as both of those are horrendously expensive and not easily translatable to hectare size exposures. I do think plastics are likely to be the way to go... I wouldn't be surprised if bioplastics end up being an extremely important tool for a Mars colony (since you could skip most of the complex industrial infrastructure). By the time we get to manufacturing structural elements on Mars, bioplastics and genetic engineering technology will likely be a lot more advanced. While it's not near term, at some point you might even get to engineering the organisms to grow in the open, unpressurized... Mars atmosphere has enough CO2 to support photosynthesis, and the thermal environment isn't beyond what some lichens can handle (lichens living at Mars pressure/temperature has actually been demonstrated). I'm curious how much difference it would make if the glass wasn't flat but was domed. For eg, doming it inwards (towards the pressure) would put some of the force in compression. AIUI, glass has a compressive strength better than two orders of magnitude higher than its tensile strength. 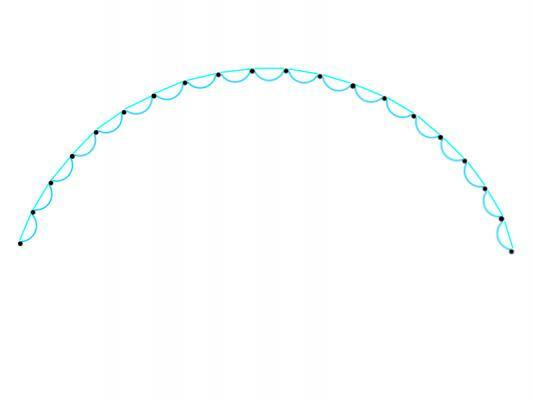 I still mean a mundane outward curving shape, but the individual glass panes would curve inwards, to convert tensile forces on the glass into compressive force. (The frame is still tensile.) I'm curious if it would make glass more viable. outward curving shape, but the individual glass panes would curve inwards, to convert tensile forces on the glass into compressive force. Good point. But you could have an outermost pane that's unpressurised and flat. Would look like one of the walls made from beer bottles :-) Perhaps no much good for looking out but ok for light. Glass both inside and out may need a protective coating from dust and scratches. 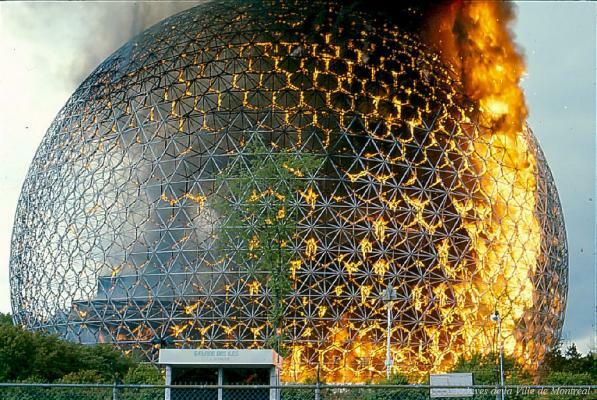 The dome did survive the fire, that happened in 1976, and is still used today, but with an open structure. I want to stay away from exaggerated concern so there are certainly ways to mitigate this. But glass doesn't burn :-) so that's solving the problem at the source. It does make for some lovely symmetries from the interior. I wonder if using small batch processes we might be able to mass produce glass that was tougher than classic soda glass. I'm thinking small panes less than 1 foot across. These would not be safe from sabotage but should survive most likely accidents. Smaller panes would make the result of the break like the one shown less dramatic. Is there any way to make the laminate for Laminated Glass? My understanding is polyvinyl butyral (PVB) or ethylene-vinyl acetate (EVA) are primarily used on Earth, and you can produce Polyethylene relatively easily on Mars. Could that be used? or would you need more. I suggested glass safety film a few pages ago. Surprisingly thin, just a few mills, and it is very tough. Simply stuck to the glass. It could come from Earth at first, then be produced locally. Assuming you're building a glass dome that has buildings in it like we usually see in SF, one way to reduce the amount of glass required is to make the buildings tall enough that they reach the roof. Those sections where they are effectively part of the roof are made of opaque materials, steel, concrete. You could cut down on the glass requirements by 50% or more. With walkways and such you can make more use of the "open to sky" volume. Alternatively you could make more use of the roof space if you have buildings. Real estate development being what it is, I guess you'd see a bit of both. 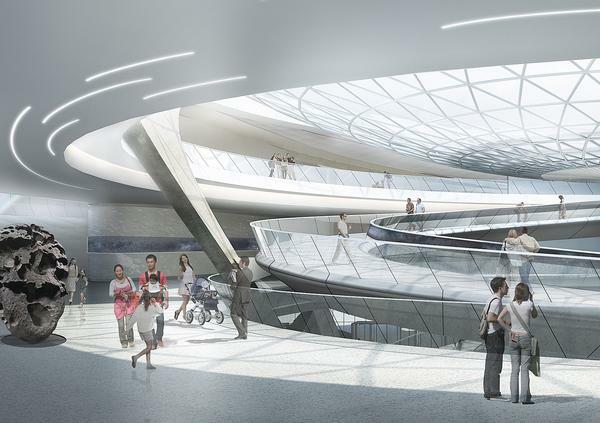 We've also previously suggested (in the Envisioning Amazing Habs thread, I suspect) hanging buildings from the frame. The weight of the buildings is much less than the outward force from the atmosphere, but reduces the load on the frame a little. Similarly, to run tensile structures from the frame to the foundation, to warp the pressure vessel into a more useful shape, then hang buildings off those tensile "pillars". Maintenance safety hazards aside, isn't a tall dome useful in itself? Isn't a a high air mass and distance from particle impacts beneficial towards radiation protection? Maintenance safety hazards aside, isn't a tall dome useful in itself? Except you aren't starting with a dome. A dome isn't a natural shape for a pressurised volume. So if you want to distort your pressure-vessel into more of a dome-like shape, you are going to need tricksy engineering voodoo. You don't think the shuttle involved engineering witchcraft? You were not paying attention. 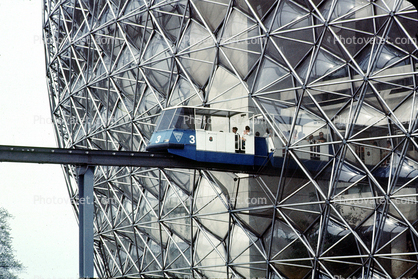 Geodesic dome with small panes. Small panes undergo much lower stress, and the breakage of a pane is much less important. Nodes further away are covered by a concrete dome with a window line. Ground is removed. This is the industrial area of the colony, and the dome houses the cafeteria. Given the updated radiation transport models with pion dose contribution, I think we're going to need at least 6m of regolith cover to achieve satisfactory radiation protection. Once the effect of atmosphere is taken into account 1m or so may do nothing or maybe even make things worse. I haven't found any papers testing the updated HZTERN models with regolith, but anything more than 20g/cm^2 of aluminium starts counteracting the shielding and 70g/cm^2 makes things worse than if there were no shielding at all. Currently we use comparisons between atmosphere to simulate regolith depth, but pions have a short decay path and would probably not show up at kilometres of very low density shielding like they would for a metre or so of shielding. This might be a half baked idea, or one that's been discussed already, but what about building a dome within a soil retaining dam filled with a heavy gas like sulfur hexaflouride or a suitably dense easily in-situ produced gas. Gas phase might be easier than liquid phase at these pressures, though it wouldn't provide anywhere near the same counter-pressure. it would make suited excursions a bit easier in the immediate area outside the hab within the dam for construction or repairs.